Hello Sugar, is a product of love for the city that helped raise us! The Lilac City, which we’ve called home most of our lives, is on a journey of transformation, which we get to be apart of! How? By creating a unique dwelling where people come together through a shared, enjoyable experience; donuts made to order, served fresh and covered in glitter. 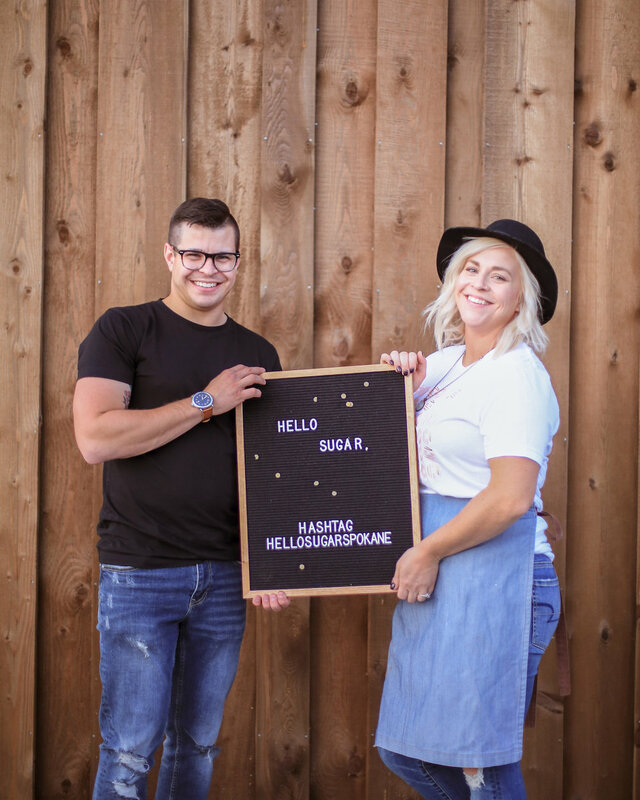 Hello Sugar, provides a fun food adventure with community in mind. Help foster growth and community through your shared love of donuts (+coffee) and Spokane! We want customers and businesses alike to feel like they are a part of something bigger than themselves. When profit takes a back seat to people, amazing things can happen. Our employees are our greatest investment and asset. We know they are capable of greatness and that their impact in the community is a direct reflection of our priorities. We can’t control what happens outside our doors, but we can make sure that your experience at Hello Sugar, is something to smile about. We want to take fun to the next level. With smiles, glitter and donuts we have almost everything we need to party. All we need is you. Ramsey and Amy are Yes people. When a family dinner turned into a business brainstorming session, they said yes to family. When a donut fryer showed up on Craigslist, they said yes to serendipity, and to an impromptu Oregon road trip. When a chance to collaborate with Indaba presented itself, they said yes to community. Now, when their three kids ask for donuts on Saturday mornings, they say yes to sweet memories. We’re pretty confident, based on their track record, that when you walk into Hello Sugar, and ask for fresh, sparkly, made-to-order mini donuts, they’ll say yes to you, too.